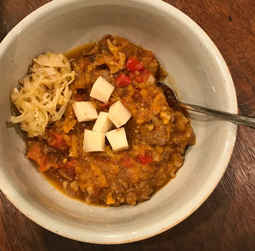 Pumpkin Chili with Sonoma Brinery Smokey Chipotle Sauerkraut - A recipe from Savor California, the online showcase for extraordinary gourmet foods and beverages from California. Recipe courtesy of Theresa Jacobson from her post on Homegrown Glow. In a soup pot, sauté onion, peppers and cauliflower in avocado oil on medium-low, until cauliflower is soft and onions are translucent. Add spices and salt. Raise heat slightly. Add ground beef and cook until browned on outside but still showing some pink inside. Mix in diced tomatoes and pumpkin. Lower heat and simmer for about 5 minutes. May need to add water or broth to get desired consistency. Serve with Sonoma Brinery and cubed raw gouda.